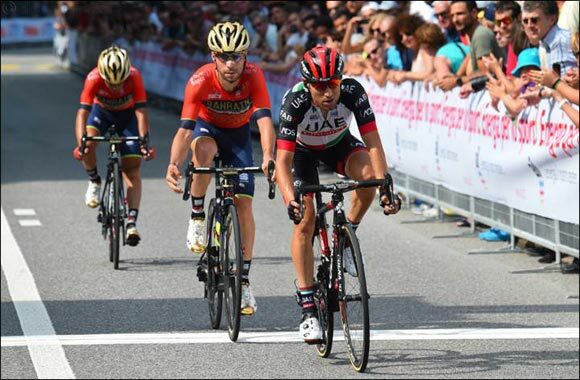 Dubai, UAE, June 4, 2018: UAE Team Emirates’ Diego Ulissi finished just shy of a podium place at the GP Lugano on Sunday, after crossing the line fourth in the 185km race in southern Switzerland. The one day race, which was won by Hermann Pernsteiner (Bahrain-Merida), was Ulissi’s first competitive ride since completing the Giro d’Italia last month. After making a breakaway midway through the day, Pernsteiner gained enough time to head into the eighth and final lap of the circuit with an unassailable lead on the chasing group. Ulissi arrived at the finish line ahead of the main peloton and just seven seconds off claiming a podium position. UAE Team Emirates' Filippo Ganna placed 28th. Elsewhere in Europe, UAE Team Emirates is currently participating in the Critérium du Dauphiné (4-10 June) and will shortly announce the line-up for the upcoming Tour de Suisse (9-18 June).